We often find ourselves feeling jealous of Lewis Hamilton on many levels as he goes about his life and those green-tinged pangs are back again after seeing the Formula 1 world champion's trip to Atlanta, Georgia for Super Bowl LIII this weekend! The New England Patriots beat the Los Angeles Rams 13-3 at the Mercedes-Benz Stadium on Sunday, handing Tom Brady and Bill Belichick a sixth Super Bowl title together. The name of the arena would suggest that Mercedes' top racing driver might have enjoyed some sweet southern hospitality in Georgia, and the view Hamilton enjoyed is certainly among the best. Hamilton was also present at an earlier Rams playoff game in LA and might be adding anther favourite sport to the list, having enjoyed surfing and skydiving in the off-season. Jealous, us? Yes very much so! 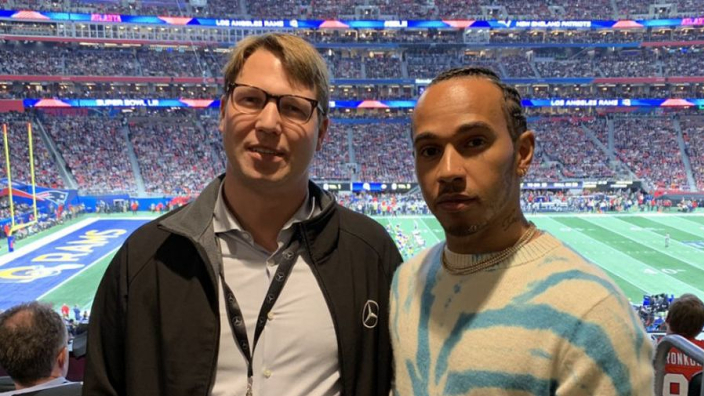 Looks like #F1 world champion Lewis Hamilton had a blast at #SuperBowl53! Hamilton won't have much longer to enjoy his time away from F1, with pre-season testing now a fortnight away ahead of a 2019 in which Hamilton will be looking to secure a sixth world title. Only Michael Schumacher, with seven drivers' crowns, sits ahead of the Briton, while Hamilton is also closing in on Schumacher's record haul of 91 grand prix wins, entering 2019 with 73 victories to his name.